(Reuters) - Sharp growth in its commercial cloud computing business helped lift Microsoft Corp's <MSFT.O> quarterly revenue above Wall Street's expectations, sending the technology company's shares up more than 4 percent in after-hours trading. "Only two companies are setting the tone of enterprise computing, Microsoft Azure and Amazon AWS," said Trip Chowdhry, managing director of Global Equities Research, referring to Amazon.com Inc's <AMZN.O> web services unit. Microsoft's revenue in what it calls its "intelligent cloud" businesses, which includes the Azure cloud platform and server software, rose 7 percent to $6.7 billion. Revenue for Azure - which customers can use to host their website, apps or data - grew 102 percent, but Microsoft did not say what the actual revenue figure was. Despite the surge in revenue, Microsoft is still struggling to increase profit in the capital-intensive cloud business. It said operating profit in its intelligent cloud businesses fell 17 percent to $2.19 billion in the quarter. Overall, Microsoft posted revenue for its fiscal fourth quarter ended June 30, adjusted for some one-time items, of $22.6 billion, up 2 percent from a year ago. That beat Wall Street's average forecast of $22.1 billion. 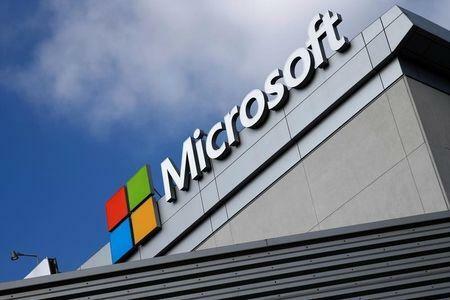 Sanford Bernstein analyst Mark Moerdler said Microsoft is finally making headway shifting Microsoft Office software clients onto subscription-based cloud services. Office consumer products and cloud services were up 19 percent and Office 365 increased subscribers to 23.1 million during the quarter. Nadella, who announced the company's largest-ever deal last month, striking a deal to pay $26.2 billion for LinkedIn Corp <LNKD.N>, has staked Microsoft's future on mobile and the cloud. So far his plan has been well received by investors. Microsoft shares are up 64 percent since his predecessor as CEO Steve Ballmer announced his plan to retire, in August 2013. The S&P 500 is up 31 percent in the same time. Microsoft shares were up 4.35 percent at $55.40 in extended trading on Tuesday.